I was super excited when Jane Houston Jones contacted me about using one of my images in a video for the What's Up series: What's Up for January 2016. I'm feeling super cool to have my name listed in the image credits, and the video was coincidentally published today, on my birthday. Neato! 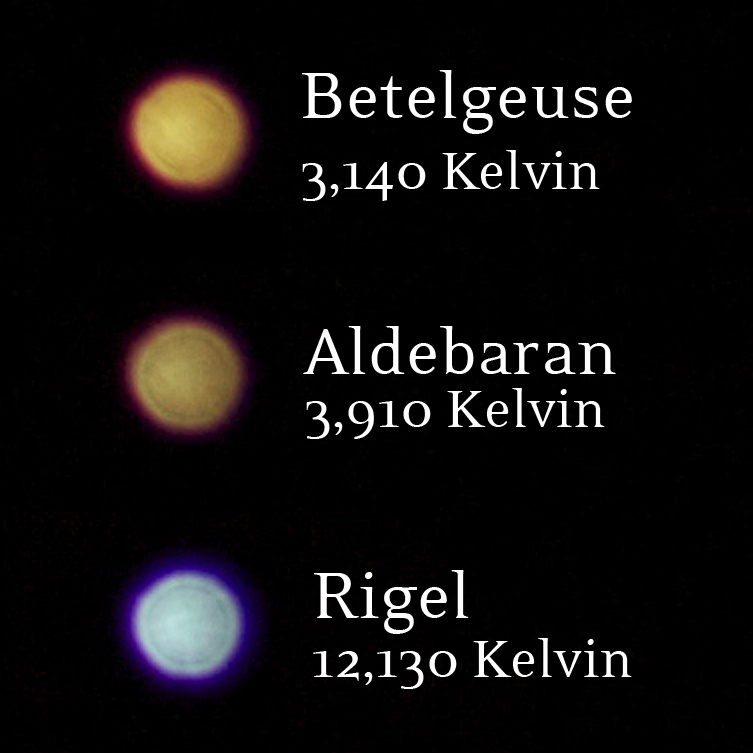 Back in 2013 I took some photos of Betelgeuse, Aldebaran, and Rigel to do a color comparison. One really simple technique to get a better look at the apparent color is to intentionally take a photo out of focus - this spreads the light of the star over more pixels on the image sensor, which not only makes the star look larger, but also helps to avoid undersampling with a Bayered sensor. In the video, the above composite is artfully cropped to make the stars Betelgeuse and Rigel appear to pop out of the constellation Orion, and then they are again compared to the hot blue base and relatively cooler upper flame of a candle. It was so cool to have these images used to help explain star color in a NASA JPL video. 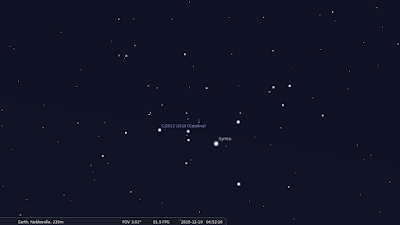 In the video, my star images fly out from the constellation Orion, cool! Star color images compared to the parts of a candle flame in this screenshot from the video. 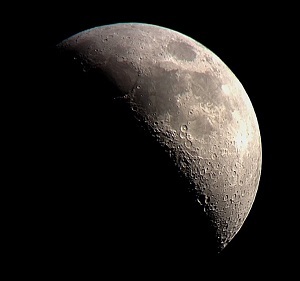 We had clear skies for the Christmas full moon, incidentally the first full moon on Christmas day since 1977. Testing out two of my new Christmas presents on Christmas evening, I got this amazing universal smartphone tripod adapter mount. There are a lot of them on Amazon, it looks like some company is making them wholesale and other companies are stamping their logo on them. Either way, it's the only tripod adapter you'll need, it's so easy to pop my iPhone in and out without removing the case. So let's check out the full moon on Christmas with both the iPhone on a tripod (with no additional lenses) compared to the Canon T5i (single frame no stacking) sent straight to my phone from the Eyefi wireless memory card. iPhone (Left) photo with no additional lenses vs. Canon T5i (right) single frame no stacking. Both pumped up using Instagram's Structure tool and a tiny bit of contrast. Check it out! I got quite a bit of detail on the face of the moon with just the iPhone itself and no digiscoping or additional lenses or anything. I used the Manual camera app to adjust the exposure and focus similar to this description except this is just a single frame no stacking. 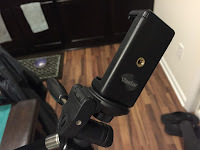 Here's a closer look at the tripod adapter. The top extends out to clip around larger phones and it has a spring in it that pulls the clamp back down for a snug grip. It's perfect for time lapses or ISS passes or anything else you need a tripod for. 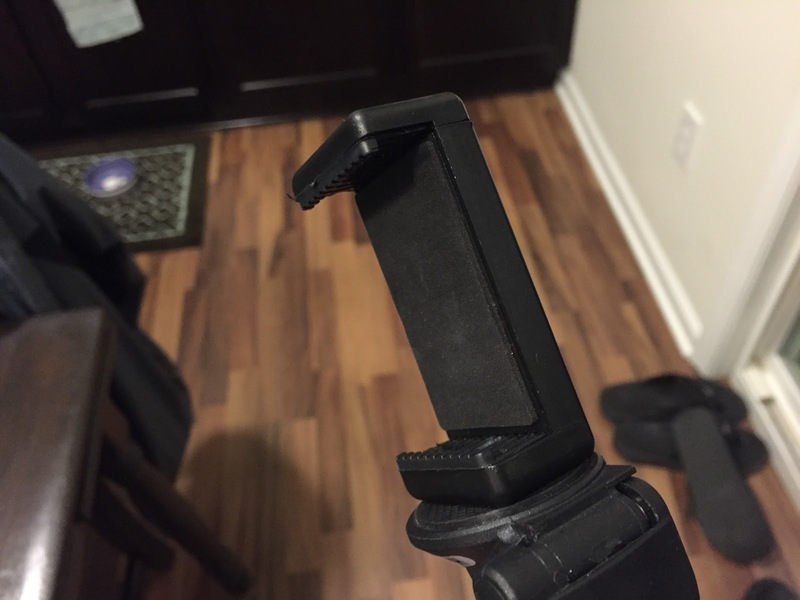 It's more convenient than this Glif mount because you don't have to take it out of the case. The Eyefi wireless memory card is another cool gift I was excited about. It lets you transfer photos directly from the memory card to your phone over its own WiFi signal (you don't have to be on the internet at home, you can be in the middle of the desert). For me, this means I can cut out the step of running to the computer to transfer images in iPhoto and then dropping them into Box just so I can tweet or Instagram something. I've done this a few times with eclipses when I wanted to share a lunar eclipse photo - I had to run in and transfer everything quick and run back out. With the Eyefi I can get the photo on my phone and cut out the middle man. I'm also looking forward to this for sports photography. I took photos of an intramural basketball championship and could have tweeted out the winners' photos right away rather than waiting. The Eyefi memory card has its own wireless network signal it can use to transfer photos directly from your camera to your phone instantly without loading them onto a computer first. This symbol on the back of the camera (yellow) means I'm connected to the card with my phone. It was easy to set up, the only confusing part was that it didn't work in RAW, it only connects and transfers with JPEG so it's good for quick moon photos or sporting events, but not something that will replace a stack of RAW files. 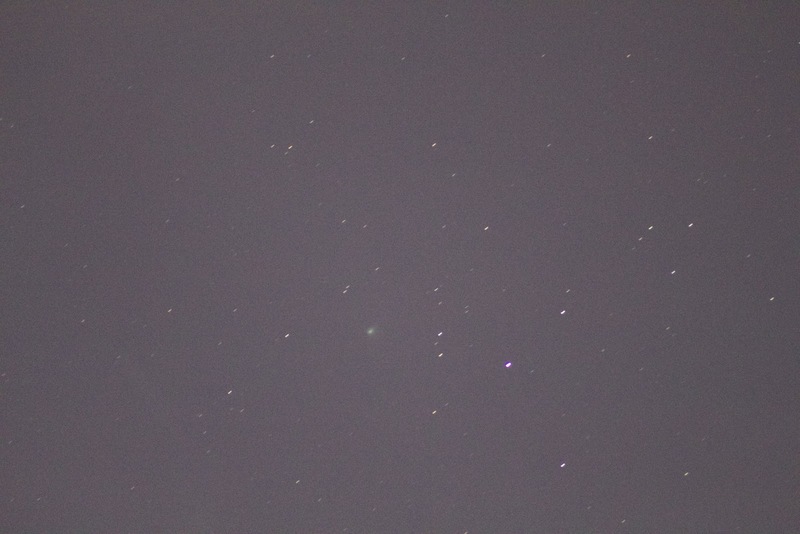 I missed the comet-moon-Venus conjunction the other day, so I've had my eye out for a clear morning to try to find Comet Catalina (C/2013 US10) rising in the Eastern morning sky. It was sort of a spontaneous morning so I ran out without looking up a sky map first. I swiveled around for a while with no luck, so I got my phone out and went to Heavens-Above.com. Screen grab from Heavens-Above.com - see how the field of view is slightly tilted so Venus and Spica look like they're at the same elevation. Totally didn't realize that at first! They had a pretty good star chart posted (below), but it was a little misleading. Maybe I'm just out of practice. At first glance it looked like the comet should be directly above Venus and directly to the left of Mars. This led to me looking way too high. The Heavens-Above chart is slightly tilted but accurate. 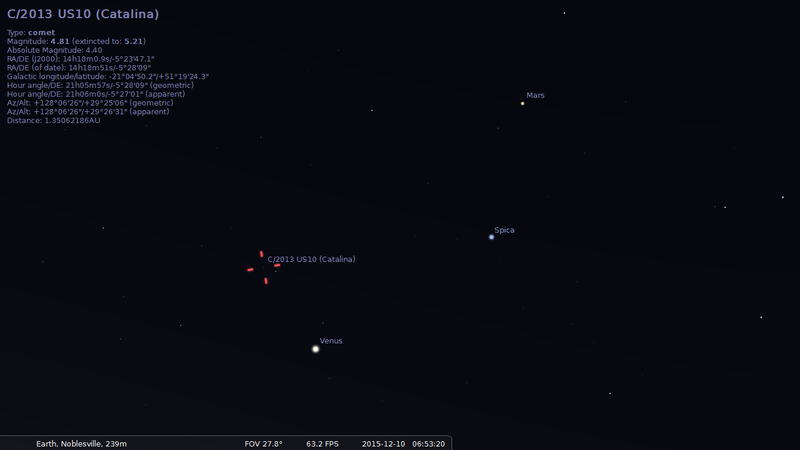 I found Stellarium to be much more intuitive. 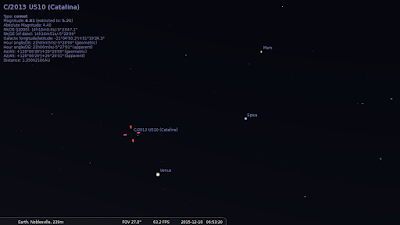 See how in Stellarium Spica is clearly higher than Venus, Stellarium feels more intuitive to me. 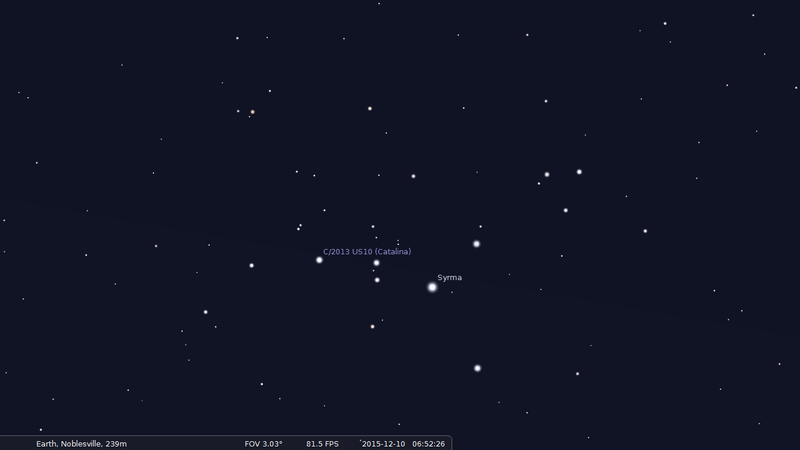 Of course I had to add Comet Catalina to Stellarium first - and it had been so long I forgot how. So then I found this helpful How To article left over from Comet ISON. It was really simple, but I was still annoyed because I was racing the rising sun! I'm used to finding things with Stellarium, so once I knew to look to the top left of Venus, it was a pretty quick find. I got that familiar rush of excitement when I first saw that little green fuzzy blob. I think I'll wait to see if it gets brighter before trying to do a tracking stack of images - but blobs count! 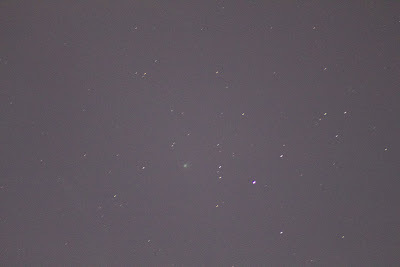 This is another confirmed comet photo!